Indiana State University officials have awarded the contract for the renovation of the Hulman Center to Hannig Construction of Terre Haute. "We are excited to kick off this much-needed upgrade to a highly used community asset," said Deborah J. Curtis, president of Indiana State University. "We are looking forward to the countless community events, concerts, dinners, basketball games, lectures and other activities that will take place in the newly renovated Hulman Center in years to come." Improvements include replacing outdated mechanical and electrical systems and failing exterior metal panel cladding and curtain walls. Updates to safety systems for fire suppression and key areas of the existing catwalk above the bowl area are also planned. Other limitations set to be remedied include adding a second, larger elevator. Hannig's base bid of $42.8 million, which includes selected alternates, was the lowest among three submitted last week. Construction is set to begin soon and is expected to take 24 months. The university will continue to hold limited activities -- including men's and women's basketball games -- during the renovation period. Heavy mechanical work will occur during the summer months. "After several months of preparation work, we are eager to get construction under way and look forward to working with Hannig Construction and its team of subcontractors to build a better Hulman Center," said Diann McKee, senior vice president for finance and administration and treasurer at Indiana State. "Not only will the university and community enjoy a facility that will better serve their needs, but we also will have the satisfaction of knowing that many people from the Wabash Valley will be employed to do that work over the next two years." Total cost for the project is $50 million, which includes construction costs as well as soft costs such as design. Funding consists of $37.5 million appropriated by the state and $12.5 million from university gifts, cash reserves and non-fee-replaced borrowing. 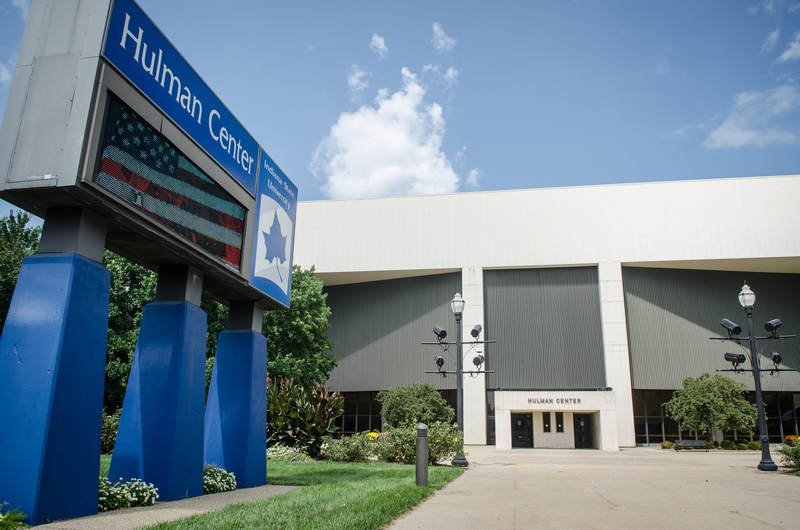 Constructed and opened in 1973, Hulman Center has long served as the university's focal point for community engagement and one of the key drivers to stimulating activities in downtown Terre Haute. Strategically located on the campus's southeast edge, the Hulman Center, which has 174,000 gross square feet, bridges campus life with Terre Haute's downtown and hosts hundreds of events for citizens of all ages. The project, which was expected to begin last summer, had to be redesigned and rebid when the low bid was $5 million higher than construction estimates.